New Location For Friday’s 8AM Class, see below. Chinese New Year Celebration at Maui Mall. I’ll be first on again doing Taiji and then again after the lion dance to do Taiji Sword and Wudang Kung Fu Sword. Master Dong’s Honolulu Workshop. February 15th to the 20th. Currently there are 12 public classes each week. Note…“Long Form” is Dong Style, very much like Yang Style and “Slow Form” is Hao Style, a rare and powerful, yet subtle form that is also well suited for beginners. Sunday, Haiku, at or near my home on Kokomo Road, for current students only: See me personally for details. Monday Lahaina, the West Maui Senior Center on Lahainaluna street. Kahului, at the “Hui Aloha area” inside Keopulani park. Kihei, at Kalama Heights retirement home in the “Billiard Room” Everyone is welcome to attend. Glad to see you are continuing to teach. 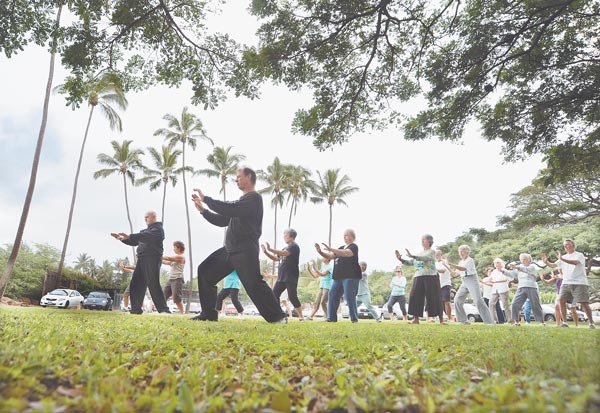 I truly enjoyed my class experiences in Maui with your tremendous knowledge and experience of Taiji and Qi Gong, It is wonderful that you are still passing the wisdom along to help so many and the Island too.